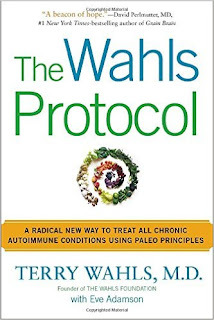 I recently read The Wahls Protocol: A Radical New Way to Treat All Chronic Autoimmune Conditions Using Paleo Principles by Terry Wahls M.D. and Eve Adamson with my McDougall filter on. That means I kept the teachings of Dr. John McDougall in mind while I read the information presented. This helps me from straying too far from my core understandings of MS and overall health while ingesting new material. Which is exactly why I read this book, I was looking for little nuggets of new information. I am happy to say that I found this book MUCH easier to read than Wahl's first book, Minding My Mitochondria 2nd Edition: How I overcame secondary progressive multiple sclerosis (MS) and got out of my wheelchair. That book was as complex as the title. But, as you can tell from the title of that book, Terry Wahls is a doctor who developed MS and beat it. In fact, she fought back from secondary progressive MS that left her confined to a tilt-recline wheelchair. How could you not be curious as to how she did that?!? Wahl's approach like McDougall is primarily dietary-based. She believes that MS and other autoimmune diseases center on the mitochondria, a component of our cells. As a result, she has created a protocol, actually three protocols designed to feed the mitochondria with the most nutrient dense diet in an attempt for the body to heal itself and prevent future damage. 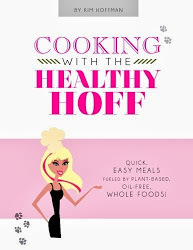 While this book tackles several autoimmune diseases, Wahls pulls primarily from her own MS experiences to get her points across and includes several anecdotes from MS patients who have followed her program. So, while this book doesn't solely focus on MS, you still get the feeling that it was written with us MS'ers in mind. Again, I was only able to pull nuggets of information from this book. Based on my McDougall teachings, I don't agree with her Paleo diet approach, which includes organic, grass fed organ meats and heavy supplementation. I think it's the emphasis that she places on greens and other vegetables that makes the difference. But again, she pulled off an amazing feat, so she must be doing something right. What I did take away from this book is a greater appreciation for seaweed, which I now consume weekly instead of the odd occasion that I eat out at an Asian restaurant. This book is how I learned of the cognitive improvement ability of Lumosity.com, which I practice daily. And it also got me monitoring and working on my Vitamin D levels more earnestly. For those reasons and her incredible, inspirational story, I keep this book in my Beating MS Library.